Beignets are a classic American pastry, even they are French in origin. Made from deep-fried choux pastry and then tossed in powdered sugar, there is no pastry quite so quintessentially New Orleans as beignets. This beignets recipe follows the traditional method of using choux pastry, which is leavened by the steam that's generated when the dough hits the hot oil. Some beignet recipes are made with yeast dough, but those are really just doughnuts. A true beignet is all about choux pastry. The best temperature for frying beignets is 360°F, so if you have a deep-fryer with a thermostat, set it for that. Otherwise, use a fryer thermometer. The oil temperature will drop when you add the dough, but under no circumstances should the oil drop below 350° or rise above 375°. The procedure below assumes you have mixed up a batch of choux pastry dough. To review those steps, see this recipe for choux pastry. You can also substitute cinnamon sugar for the powdered sugar. 1 quart refined high-heat vegetable oil, like safflower, sunflower or cottonseed oil. In a deep-fryer or Dutch oven, heat the oil until it reaches 360 F.
Gently add a generous tablespoon of dough at a time to the hot oil. Don't overcrowd the pan. You should probably avoid frying more than six at a time. Fry for 2 to 3 minutes, turning occasionally with tongs so that they brown evenly. When they're fully browned, remove to a sheet pan lined with paper towels. Repeat the process until you have no more dough. 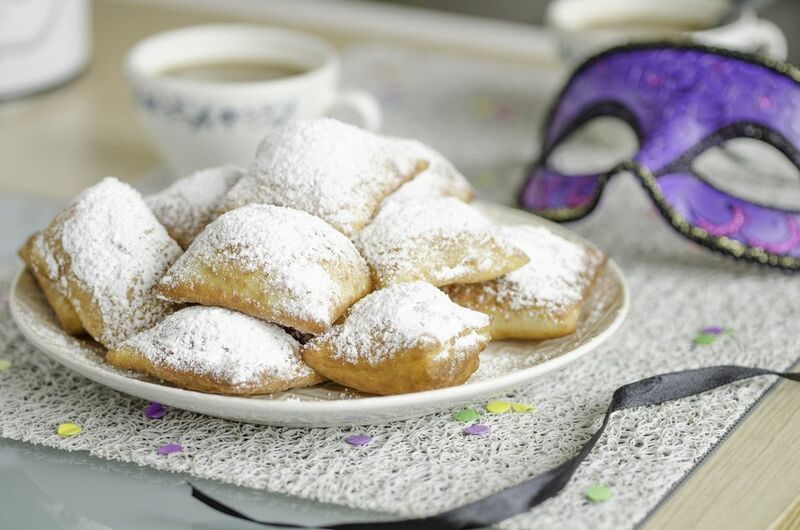 Once any excess oil has drained from the finished beignets, toss them in sugar while they're still warm. Serve with jam, vanilla custard sauce or chocolate ganache dipping sauce.